Hello, Blog Hoppin' followers! I am Rachel from Sub Hub, and am thrilled to be able to post here on Blog Hoppin'. I have been a substitute teacher for 4 years and have been pretty successful in that realm. I am personally requested for most of the jobs I get, and I have been lucky enough to land quite a few long-term positions too. This helps tremendously since a full-time teaching position has thus far eluded me. Sub Hub is a blog I started to offer tips and strategies to substitute teachers and full-time teachers preparing for substitutes. I offer emergency substitute lesson plans on both the blog and Teachers Pay Teachers and lots of other activities and time fillers. 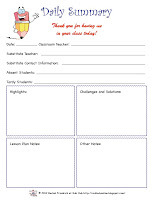 There are classroom management suggestions, and today I am offering some tips for subs to get more work as well as a freebie of a Daily Summary Form. I can also be found on Facebook, Twitter and pinning to my 50-and-counting Pinterest boards. RtI resources and Data you can USE!!! Thank you, Dr. Martin Luther King, Jr.!! Shaving cream and glue winter fun!